This theme is built in twitter bootstrap, So it has a fully responsive layout and your website will look awesome on big screens as well as on tablets and smartphones. MedicalPress theme provides compatibility with WooCommerce plugin. So, You can build an ecommerce shop into your website using this theme. MedicalPress theme is also compatible with WPML plugin. So, You can build your website in multiple languages. MedicalPress theme includes Google reCAPTCHA integration to prevent spam messages from appointment forms and contact form. Note: Not all appointment forms support google reCAPTCHA due to design limitations. MedicalPress theme includes revolution slider as part of its package and you can create powerful and great looking slides using it. This theme is compatible with Visual Composer plugin and this plugin is included within the theme package for free. Note: None of the demo pages are built using visual composer and it is an extra facility that you can use to build your own custom pages. This theme is fully hand coded and its HTML is written keeping in mind your sites good ranking on search engines. The theme has good use of h1,h2,h3 tags and most of its contents supports basic microformats. MedicalPress theme provides theme options to change the site fonts to any Google font of your choice. This theme provides easy to use styling options with in theme options. So, you can change the backgrounds and colors throughout the website. So, What are you waiting for? 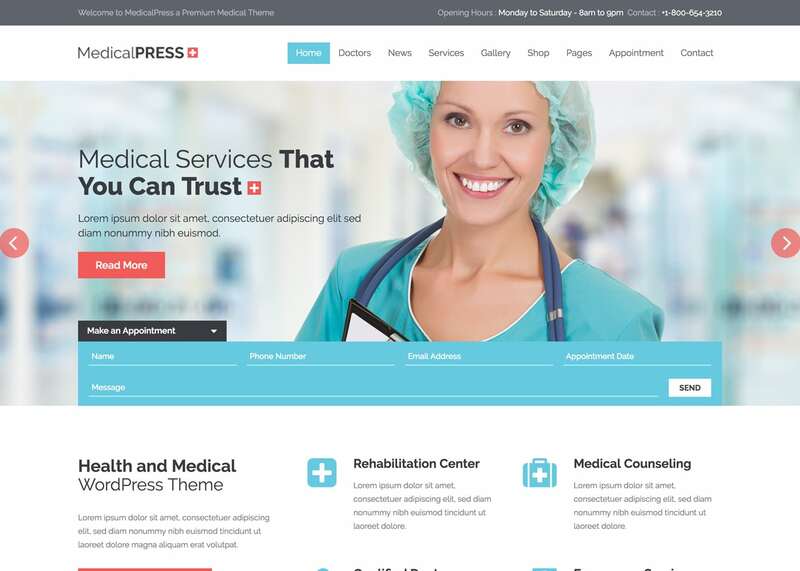 Install MedicalPress and take your website to next level.